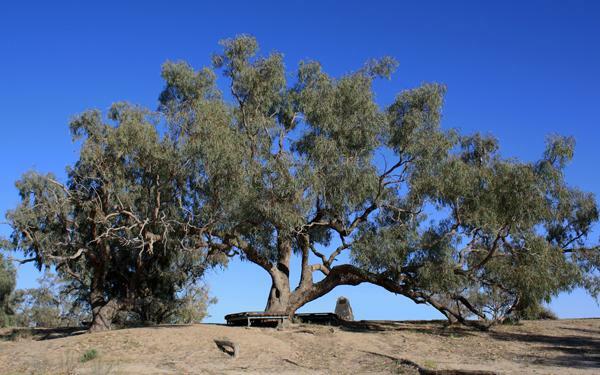 The Fifth Burke and Wills Historical Society 'Gathering' will be held on 21 April 2011 under the shade of the Dig Tree on the banks of Cooper's Creek in remote south-west Queensland. The Society will meet on 21 April 2011, exactly 150 years to the day that Burke, Wills and King returnedfrom Carpentaria to the Depot Camp to find that Brahe and the Depot Party had departed nine hours earlier. We had hoped at the time of this, our latest update, to have been able to tell you all of some firm plans and agendas that we had been able to put into place for our proposed gatherings. Unfortunately we have continually had to postpone our plans for a trip to the site, meetings with local Council and stakeholders and associated plans to finalise our arrangements in terms of specific venue (ie campsite for the BWHS attendees), planning for any day trips or even for the proposed “walk in” to the Dig Tree site on the evening of 21st April and so forth. Given the current road conditions, weather patterns and Bureau of Meteorology prognosis, it appears unlikely that we will be able to organize what we had hoped for the 150th Anniversary celebrations on April 21st 2011 (and surrounding dates). We have been severely hamstrung in our plans to try to provide ablution (shower and toilet) facilities for the site and without substantial planning and site examination/selection, it seems unlikely that we will be able to address this and other planning issues. Even were the weather to be fine for the critical period, there is no guarantee that a large body truck or semi trailer will be able to access an appropriate site to unload such a facility without becoming a victim of boggy ground. There is little doubt that provided the site is accessible by 4WD at the time of the anniversary, there will probably be a significant number of diehards, myself included, who will find our way to the site for the occasion - but the message to all of us is clear – do not plan the “holiday of a lifetime' as it may not come to fruition and may even become the 'enforced entrapment of a lifetime' should we somehow manage the pilgrimage to the site and be presented with more significant rain events. Planning is severely disrupted, to the point of threatening all that we had hoped to have in place. Cooper Creek is in a state of continuing flood and appears likely to remain so for some time. It is likely that the situation will remain that way throughout the summer. Should a break in the weather present itself at the appropriate time, there will probably be quite a few diehards amongst us who will still make the pilgrimage. Those who do so will need to be very much self-contained and self-reliant by ensuring that we carry ample fuel, foodstuffs, water, general supplies etc so that if we are trapped by another flood event we can sustain ourselves for a prolonged period if necessary. We have resigned ourselves to the possibility that we may simply have to utilize the existing “long-drop” toilet at the Dig Tree site and camp wherever we can adjacent to the actual Dig Tree site itself, shower if and when we can get to Innamincka etc etc. We will be in touch as time progresses and the prospects for the gathering become clearer.